It might be easy for some to dismiss procurement as a simple function of acquiring goods and services, but as procurement professionals, we understand the reality is very different. Procurement is a critical strategic function of any competitive business, delivering efficiency, ensuring seamless operational activity, and reducing both capital and operational expenditure to increase overall profitability. Key to our role is the knowledge and understanding of supply chains, enabling data-led insight that ensures we’re equipped to provide that strategic function in the most impactful way possible. That’s why unmanaged indirect spending can be such a challenge to our businesses. What is indirect procurement spending? We all understand the function of procurement, but how does indirect procurement fit in? Simply put, this is indirect spending necessary for the everyday running of a business, rather than the purchase of goods or services directly incorporated into an end product. That’s everything from the electricity to power the bank of bright lights above you to the 15,000 staples your office somehow gets through each month. Indirect spending is a complex and challenging element of a supply chain to understand and manage. However doing so can generate a significant financial benefit. Analysts EY suggest that a 5% reduction in indirect spend can translate into a 1%-3% impact on a company’s bottom line. That’s certainly an area worth tackling. How much of a problem is it, and why? The 2017 Deloitte Global Chief Procurement Office Survey highlights that 79% of top CPOs cite cost reduction as their business priority in 2017, and 40% note consolidating spending as a key lever in achieving this goal. Yet traditionally the complex nature of indirect spending has provided a frustrating hurdle to this ambition. What are those hurdles? Multiple stakeholders – the number of stakeholders and diverse purchases involved in this spend make oversight highly complex. No established processes – often indirect spend falls under the ‘as and when’ requirements of purchasing, meaning there’s no specific systems or access to data to understand the supply chain, and no understanding of best-practice purchasing by those undertaking the spend. Hard to predict – the challenge of ensuring easily managed data insight can means predicting and planning for indirect spend can be a frustrating process. No leveraged purchasing position – unlike our relationships with key suppliers, indirect spending often involves general purpose items which suppliers sell to a large number of businesses. This reduces the leverage procurement professionals have in negotiating supply discounts. What can you do about indirect spend? The first step to tackling indirect spending requires implementing established structures for all stakeholders, ensuring purchases are recorded and analysed as part of the procurement function. This understanding ensures procurement professionals are in a position to assess where areas of cost-cutting can be implemented. While these steps might seem simple, this process requires organisation-wide buy-in and often challenging implementation. Luckily digital technologies are offering procurement professionals a tool to understand indirect spending that they could once only dream of. Procurement software such as Procurehere offers a platform for efficient requisition orders and procurement processes with detailed oversight. 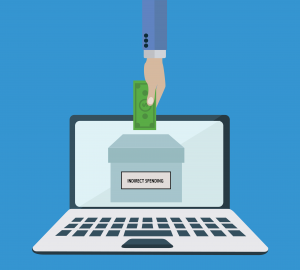 Thanks to the user-friendly nature of this type of e-procurement system, such purchase orders and requisitions can be rapidly approved using established approval pathways, vastly reducing the time for approval. This eliminates the most significant point of resistance when it comes to managing indirect spending by avoiding lengthy delays and approval processes. Procurement professionals using Procurehere can manage this purchasing pathway with on-going insight and clear purchase histories that provide effective tools to monitor company-wide procurement. That allows you to make informed decisions that can deliver significant savings. What’s the end result? According to EY, optimisation of indirect spend could save up to 25% on current costs. So are you ready to tackle your indirect spend? Want to explore how e-procurement can help manage indirect spending for your business? Take a trial with Procurehere today.